Package includes: Slice Digital Fabric Cutter, power cord, 3 replacement blades, blade adjustment wrench, 6" x 6" fusible web sheets, user manual, quick start guide, Applique Basics Design Card, Design Guide Booklet. We are unable to reorder the blades. Each Unit comes with 3 replacement blades in the box. It's time to get creative! This cordless digital shape cutter cuts fabric; paper; vinyl; and more! 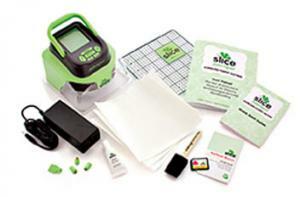 This package includes one 5-1/2x5-1/2x4 inch Slice Digital Shape Cutter; one power cord; three replacement blades; one blade adjustment wrench; one 6x6 inch cutting mat; one repositionable adhesive foam brush; three 6x6 inch fusible web sheets; a user manual and quick start guide; an Applique Basics SD design card; and a design card booklet. The SLICE™ is a revolutionary fabric-cutting tool that makes quilting easier. Don’t spend hours cutting intricate designs with scissors when you can save time by allowing the SLICE™ to do all the work for you. The SLICE™ works with design cards specifically customized for fabric so you can cut alphabets, numbers, flowers, icons, basic shapes, and more. Apply a fusible web to your cotton fabric, felt or flannel and you are ready to start Slicing. If you can imagine it, you can SLICE™ it. The SLICE™ is unlike anything you have ever seen. It’s a one-of-a-kind tool that fits within everybody’s budget. Save time and money while creating projects that will last a lifetime. The Slice (tm) is a revolutionary fabric-cutting tool that makes quilting easier. Don’t spend hours cutting intricate designs with scissors when you can save time by allowing the Slice to do all the work for you. The Slice works with design cards specifically customized for fabric so you can cut alphabets, numbers, flowers, icons, basic shapes, and more. Package includes; Slice (tm) Cutter, power cord, 3 replacement blades, blade adjustment wrench, 6" x 6" fusible web sheets, user manual, quick start guide, Applique Basics SD design card and design card booklet. Slice Cutter, power cord, 3 replacement blades, blade adjustment wrench, 6" x 6" fusible web sheets, user manual, quick start guide, Applique Basics SD design card and design card booklet. Whatever I order, it arrives so quickly. Thank you for such good service. I recived the fabrique slice! Im very happy, my experience eas realy good with allbran! thank you for everything! !